Social media like Twitter is revealing in that it demonstrates the interpretative frameworks of various so-called “influencers” and their followers. Case in point was a Twitter storm between Laura Loomer and one Tariq Nasheed, a black self-described historian and MLK Conservative. 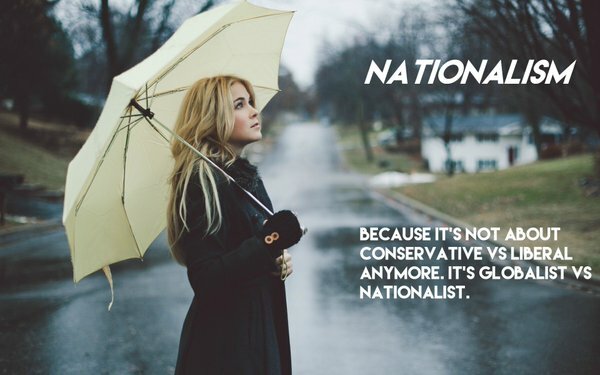 Nasheed has 212,000 Twitter followers, has a radio show and spends most of his efforts playing on the one-trick pony “white supremacist” epithet. He does this against personalities in the Alt-Right, including what The New Nationalist (TNN) feels is controlled-opposition Alt-Right. Loomer has 114,000 followers on Twitter. Nasheed decided to challenge some assertions from Loomer that Jews control the media and finance. He asked for evidence that this was the case. Laura Loomer (a Jew) set Nasheed straight. Hundreds of cognoscenti jumped all over the rather elementary factoid about Jewish Power like it was some kind of revelation and Eureka moment. It was retweeted, discussed, and given likes all over Twitter. TNN Takeaway: We wonder if Loomer, as a Jew, is just bragging, or does she have a larger issue to address? We also wonder what the response would have been if little ol’ goy TNN had called Nasheed out for his astonishing ignorance of such an important fact. We would suggest that it is at worst prohibited or at best frowned upon. Indeed, the brainwashing is so pervasive that ownership of such a topic is claimed by Jews. We here at TNN have a modest goal of extending the Overton Window wide enough to permit non-Jews to enter this conversation. Would that be okay, controllers? 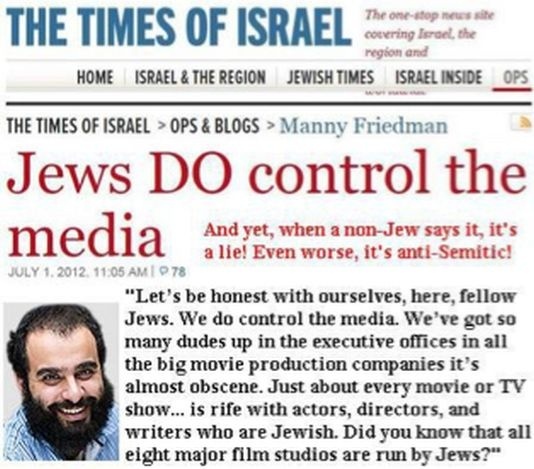 In the meantime, he are the facts about Jewish ownership and management control of all media. To Nasheed: Jewish control is not the same animal as “white” control. As usual, we need to ask the Loomer-Nasheed cognescenti: How has that been working for ya? Who controls the news? Of the 67 senior executives of the major television and radio news networks, 47 are Jews or have Jewish spouses. This is a numerical representation of 70%. Jews are approximately 2% of the U.S. population. Therefore, Jews and spouses of Jews are over-represented among the senior executives of the major television and radio news networks by a factor of 35 times, or 3,500%. Who controls corporate media? 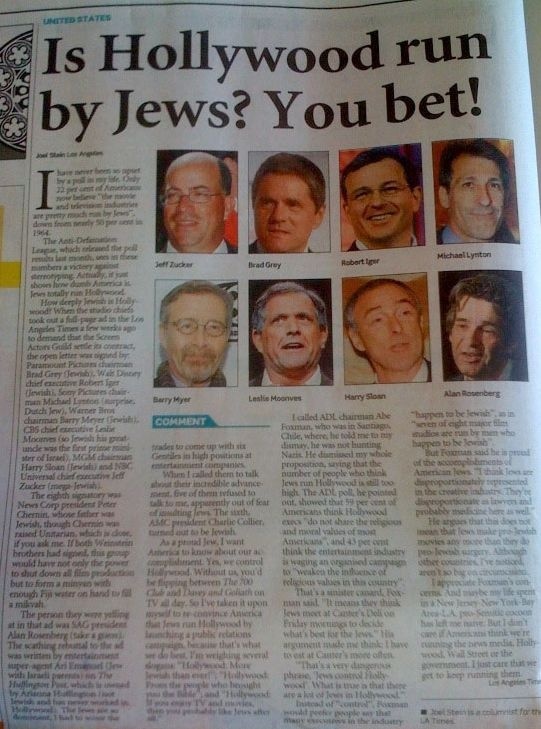 Of the 12 senior executives of the “Big Six” media corporations, nine are Jews or have Jewish spouses. This is a numerical representation of 75%. Jews are approximately 2% of the U.S. population. Therefore, Jews and spouses of Jews are over-represented among the senior executives of the “Big Six” media corporations by a factor of 37.5 times, or 3,750%. Who controls Hollywood? Of the 60 senior executives of the major Hollywood studios, trade unions, and talent agencies, 50 are Jews or have Jewish spouses. This is a numerical representation of 83%. Jews are approximately 2% of the U.S. population. 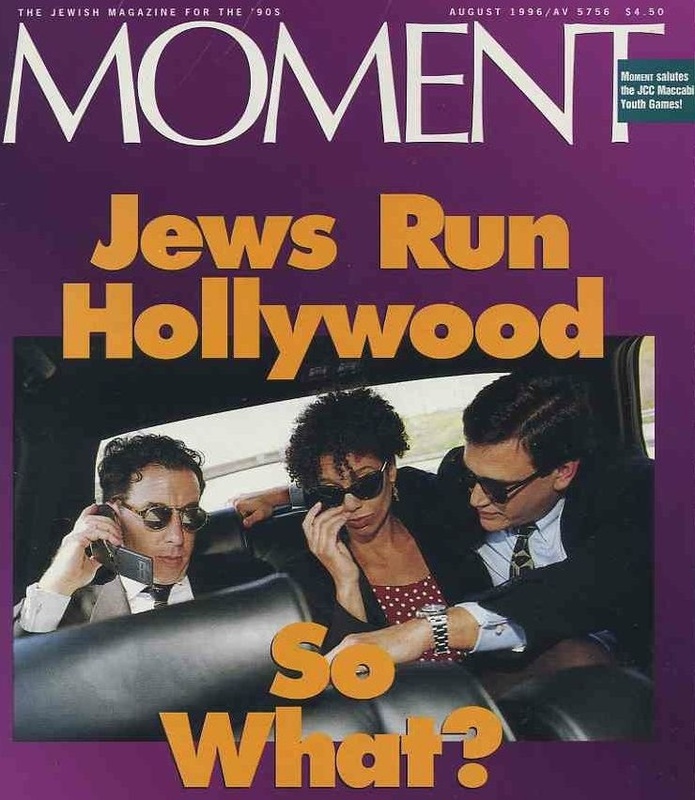 Therefore, Jews and spouses of Jews are over-represented among the senior executives of the major Hollywood studios, trade unions and talent agencies by a factor of 41.5 times, or 4,150%. Who controls television? Of the 64 senior executives of the major television broadcast networks, cable networks and production companies, 56 are Jews or have Jewish spouses. This is a numerical representation of 88%. Jews are approximately 2% of the U.S. population. Therefore, Jews and spouses of Jews are over-represented among the senior executives of the major television broadcast networks, cable networks and production companies by a factor of 44 times, 4,400%. Who controls music? Of the 50 senior executives of the major music labels and trade organizations, 39 are Jews. This is a numerical representation of 78%. Jews are approximately 2% of the U.S. population. Therefore, Jews are over-represented among the senior executives of the major music labels and trade organizations by a factor of 39 times, or 3,900%. Who controls radio? Of the 46 senior executives of the major radio broadcast networks and station owners, 28 are Jews. This is a numerical representation of 61%. Jews are approximately 2% of the U.S. population. Therefore, Jews are over-represented among the senior executives of the major radio broadcast networks and station owners by a factor of 30.5 times, 3,050%. Who controls advertising? Of the 46 senior executives of the major advertising corporations and trade associations, 31 are Jews. This is a numerical representation of 67%. Jews are approximately 2% of the U.S. population. Therefore, Jews are over-represented among the senior executives of the major advertising corporations and trade associations by a factor of 33.5 times, 3,350%. Who controls print news? Of the 65 senior executives of the major newspapers and news magazines, 42 are Jews or have Jewish spouses. This is a numerical representation of 65%. Jews are approximately 2% of the U.S. population. Therefore, Jews and spouses of Jews are over-represented among the senior executives of the major newspapers and news magazines by a factor of 32.5 times, 3,250%. Hillary Clinton: Electing a Foreign Spy for President? The qualification bar for being an “anti-semite” is the equivilent of tripping on an uneven sidewalk crack. The truth is anti-semitic. What Did Elliott Abrams Have to Do With the El Mozote Massacre?